This is a line I’ve heard from both women and men who reach out to me in my role as a Residential Professional Organizer. 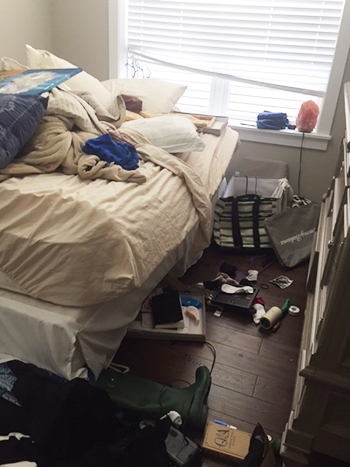 You can see from the pictures below that Nadine (fictional name) was overwhelmed with her messy bedroom, closet and dresser drawers. She travels for work weekly having relocated recently to Chicago after college. Part of the project was done in advance. Per my suggestion, Nadine did load after load of laundry and then stacked folded clothes in piles by category in the living room. After asking questions about the clothing piles, I immediately set up two shopping bags. 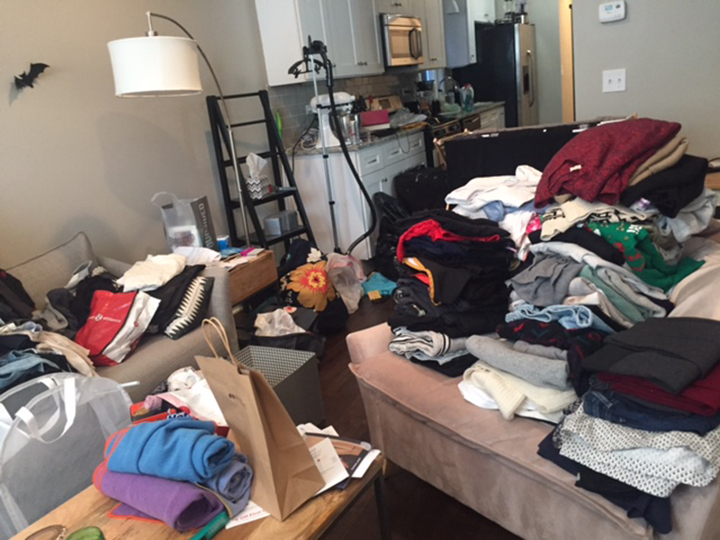 Even when clients tell me they recently decluttered/purged, usually there are more items they realize they will not wear. On one shopping bag I wrote DONATE. And the other shopping bag I labeled ASPIRATIONAL. 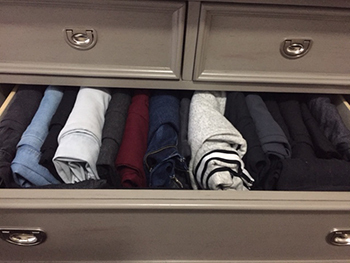 It’s always better to separate out clothing that doesn’t fit now that you hope to wear in the future; then contain and label and store elsewhere than your main closet. 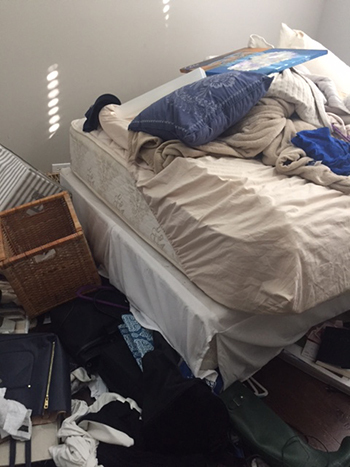 We then gathered garbage bags and first picked up obvious trash and Nadine found more dirty laundry from the bedroom floor/bed which she put in her hamper. She had previously sorted items that needed to be hung up so I gathered empty hangers from the closet and put clothes on hangers while Nadine made donation/aspirational decisions from clothes already hanging in the closet. All hanging clothes got sorted by work vs. casual, and short sleeved vs long sleeved, as Nadine’s work was going to bring her to a warm weather climate during the winter months. We then tackled her dresser drawers. I showed her the folding technique that resembles book ends (see picture below). 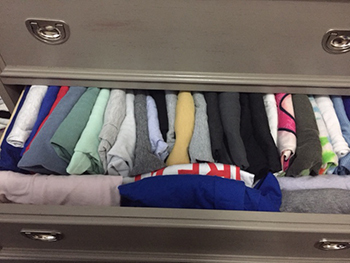 You can fit more t-shirts/sweaters/pants in a dresser and also see what you own to more easily and quickly make decisions about what you want to wear! Nadine was excited to change her messy habits in order to keep her clothes neater now that she is living alone and working full-time. Nadine had shoe boxes lying around which we used to sort socks by category (knee socks/peds/ankle socks) and nylons and tights. 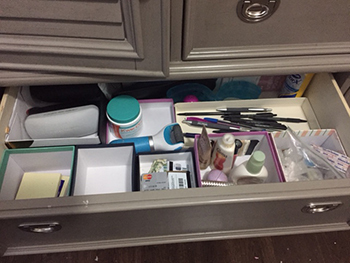 We used the other boxes as drawer organizers as you can see from the picture below making it a more organized “junk drawer” with hair ties, pens, stamps, post-its, lip balm/hand lotion, nail files, and change all easily retrievable. The loose Fall/Winter boots were constantly tipping over on the shelf in the closet and frustrating Nadine. 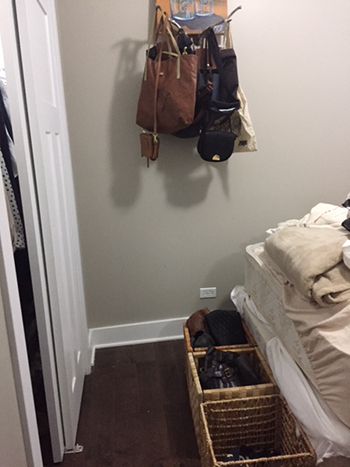 She had wicker baskets which I suggested house these boots as well as hats and gloves and placed at the foot of her bed instead of on the closet shelf. We accomplished everything in three power hours!